Global warming has me terrified. Absolutely terrified! The whole planet is being burned to a cinder. This heat is going to destroy every living thing. 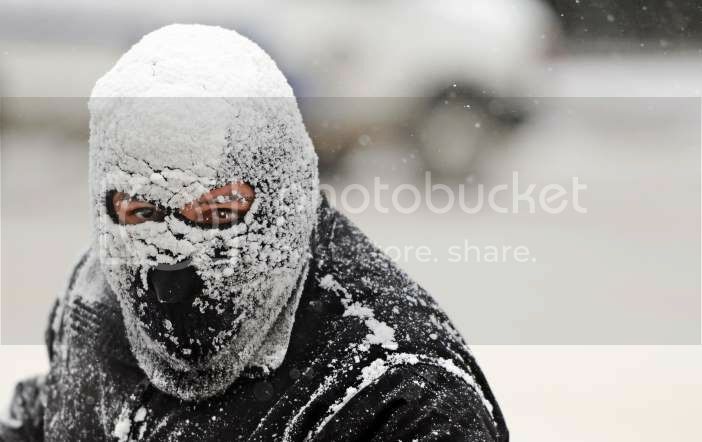 As I shovel all this snow, the sweat keeps running down my face. So, you see? 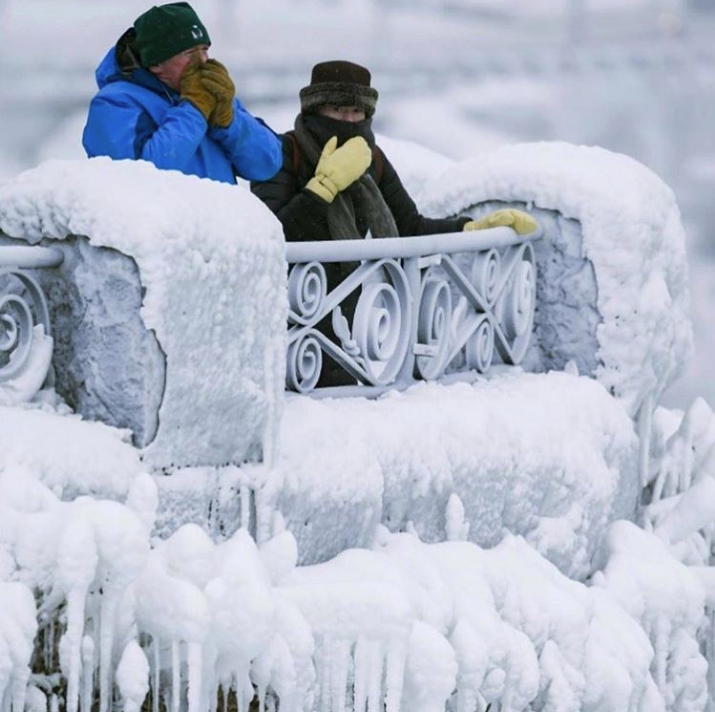 — even when we’re freezing our asses off, global warming is still burning us up! Algore is right. We’re all doomed. Ice, and snow, and blizzards are NOT cold — they’re HOT — it’s called Global Warming. I know you didn’t write that, but whoever did just show’s their ignorance of science. Global warming forces a change in set weather patterns, gulf streams, etc. By altering that balance, the summers become hotter, winters colder, and unfortunately, the chance in weather begins to wreak havoc on ecosystems. There wouldn’t BE that crazy winter storm perhaps if the yearly weather patterns weren’t out of whack. Wow, well, I hope it was a joke then, because you seemed from your posts to be a really intelligent guy to me. Sad to see the term ‘Global Warming’ still being used by people who should know better. It gives a false idea of what’s really happening, feeding the sort of idiots populating pubs and bars and spouting on about "all that snow in New York, where’s your global warming now? " The pseudo-scientists who manipulate the climate data call us “climate change deniers”. You betcha. I’ll run for president of the Deniers Club! Not when it’s real purpose is to “legally” steal money from one group of people to supposedly give it to another. Do we need to be aware of what we are doing in regards to using our resources? Yes. Don’t need scare tactics based on admittedly forged “data” to do it. I saw a bumper sticker on a car last year that made me laugh, if it weren’t so true. The problem is that despite the “scientists” admitting they faked the “data” people still believe that we are causing it. Since then, there has been independently verified data that if we basically turned everybody’s technological level back to the stone age, it would have little to no effect on the “human-being caused global warming.” Here is a wild idea, can “global warming” happen? Sure. We have been on this planet an infinitesmal amount of time in relation to how long the earth has been around (on both sides of that theory, Creationism or the theory of Evolution). We already know that nature operates in cycles, it proves it every year. Who is to say that the “warming” or “cooling” isn’t just a part of some huge natural cycle that we have no influence on? 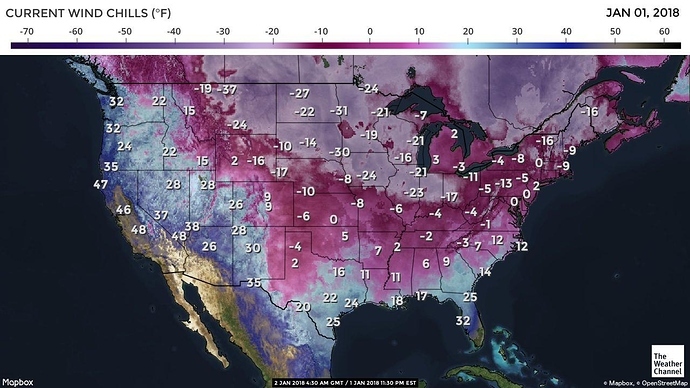 Global Warming is gripping the U.S. – Somebody call Al Gore ! 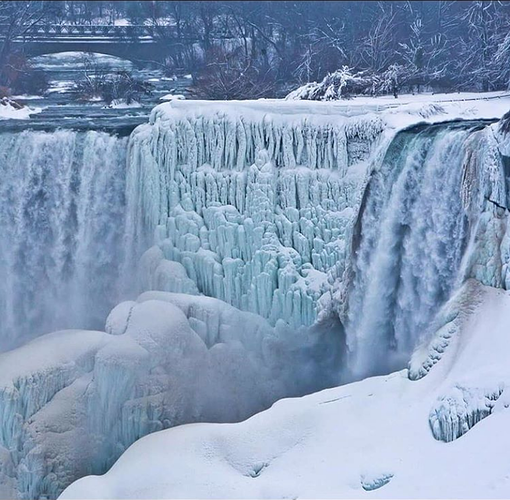 It’s so hot that Niagara Falls is frozen ! The scientific evidence is overwhelming that global warming is occurring and that human activity is responsible for most of this trend. However, its inherently impossible to have scientific evidence of things that have not happened yet so the questions as to how serious this is and what do we do about it and how soon and what does it mean for different regions/activities, remain open to debate. I do trust scientists to do their job, and what they’re good at is measuring stuff that’s measurable. As for planning and predicting, I wouldn’t trust them to predict tomorrow’s Monday. If we have to rely on them for policy we’re right up the creek. Global warming may be real, although if it is, it’s pretty minor and the earth is always either having a warming or cooling climate. We have regular, cyclical ice ages even in times when CO2 has been massively in excess of what it is now. 1970’s I remember a big scare because we were heading towards the next Ice Age, which was overdue - then bless me old Michael Mann and his discredited “Hockey stick graph” - ( yes the same one as in the “Al Gore” stupidity )popped up and related the “Increase in temperature” from the end of the “Little Ice age” to the 80’s to an increase in CO2 (he said) due to the Industrial revolution having pushed the CO2 content of the Atmosphere up from just over 3 parts in 10,000 to “nearly 4 parts in ten thousand” an increase of less than 1 part in 10,000 which is a miniscule 0.001 %. As I think @Clint said earier, the fact that Mars (and also Jupiter) were increasing in temperature was totally ignored) There was a huge reliance placed on the fact that Venus was very hot and had “CO2” in it’s atmosphere - but that was then shown to be because of a massive underestimation of the age of that planet . Then that too died a death. Then there was that complete debacle over the conspiring e-mails from University of East Anglia et al, which as also been “Massaged away”. There has never been a reasoned and demonstrated proof that CO2 is in any way responsible, for what may or may not be a Raising of temperature from the end of teh “Little Ice age” (WHich incidentally was “smoothed away” in the figures presenntd by "Mann " and others, as was the “Medieval warm period” when England had a climate more akin to Mediteranean perhaps - without any “Man made CO2” at all ! It’s cobblers ! - BUT the lie has been manipulated and used to line the pockets of a huge industry and a whole new “Science” - WIth professorships, grants, Bursaries etc etc all queueing up to be harvested. Nowadays every layman “knows” it’s true and by manipulating well meaning but gullible celebrities like “Attenborough” who really should be let out to pasture now, the “Scare” has received a credibility it certainly does not warrant. Anyone who wants to even question the vailidity fthis new “Religion” is simply told to " shut up it’s clearly true - Scientists have proved it !" But Never has there been a proper debate nor an examination of the “Hypothesis” by " independepended thinkers" - Much is made instead of “Peer reviewed documents” - well they’re all getting the cash from the same places, so it’s hardly surprising is it ? A few like David Bellamy - a very knowledgeable Botanist who said “don’t be silly, CO2 has been far higher in the past, without “warming” and anyhow - It’s plant food - Great for feeding the starving masses” - was dumped from the TV instantly and has never been heard from again. The number of good people who have committed suicide ad had reputations and cereers wrecked for daring to ask why the Emperor was naked, is large and will never be properly known. There has never been a chance for the arguments and counter arguments to be heard - Just guesswork stated as fact ! and all questioning ruthlessly suppressed. There are even whole websites giving the “Answers to any difficult questions” which may be asked. This is organised manipulation of people’s thoought patterns and a refusal to accept that critical thinking should have anty place in the “modern world”. Our children have been indoctrinated with the new Faith and their children are being indoctrinated even as I type. It’ll be interesting to hear the words “Global Warming” Denied as the world cools towards the Maunder Minimum, although it has already started with the denial that Global warming is the right phrase - "We must call it ‘Climate Change’ " and sure enough, that is all you now hear on TV or read anywhere ! The BS the unscrupulous will come up with to protect their income eh ? Now “Even the bell-boy is an expert on Global Warming and offerring advice !” - WHat do we do with a market in that position ? - Why SHORT IT - of course ! There’s been plenty of opportunity for the counter-argument to be put, in fact that window’s still open. Its not tried often though because almost the entire scientific community accepts that global warming is occurring and that the largest cause (not the only cause) is human activity. So it seems rather pointless to argue the contrary, similar to arguing that gravity doesn’t work. But if you know scientists who can show this the rest of the world they’re wrong,you should encourage them to come out and do it. That’s how science works. Global warming is only one part of Climate Change, the result of adding greenhouse gases to the atmosphere. Energy arrives from the sun in the form of visible light and ultraviolet radiation. The Earth then emits some of this energy as infrared radiation, which is prevented from radiating into space by greenhouse gases (GHGs). Just a tiny amount of GHGs - less than 1% of the atmosphere - keep the Earth around 33°C (59.4°F) warmer than it would be without them. Greenhouse gases act like a blanket, keeping in some of the sun’s warmth. Increasing the amount of GHGs through burning fossil fuels is like wrapping the Earth in a thicker blanket. This results in Global Warming. Just a tiny amount of GHGs - less than 1% of the atmosphere - keep the Earth around 33°C (59.4°F) warmer than it would be without them. Water Vapour is by FAR the biggest of the "GHG"s - but was assumed to be fairly constant (IT is far from “Constant” but it was and still IS far too difficult to calculate) by the little guy “Arhennus?” (sp) who first proposed that it was increases in CO2 from Volcanic eruptions way back in the 19th Century that caused temperatures to rise. almost the entire scientific community accepts that global warming is occurring and that the largest cause (not the only cause) is human activity. So it seems rather pointless to argue the contrary, similar to arguing that gravity doesn’t work. Anyone who wants to even question the vailidity fthis new “Religion” is simply told to " shut up it’s clearly true - Scientists have proved it !" Where does the figure for Man made CO2 come from, and what does it include? A strange interpretation of my figures , I’m not even sure I follow your logic. So the Total contribution of CO2 to the 33 degrees you put forward as the "warming"effect should equal 1.32 degrees - of which the “warmists” seem to claim 0.33 degrees as the man made contribution. [Edit - Nor do they explain WHY the chosen “starting point” for the temperature figures was as the world was warming up after the “little Ice age” thereby artificially lowering the “start” - But those are the sort of tactics we come to expect !